There are 31 blog entries for October 2011. Monday, October 31st, 2011 at 11:23am. 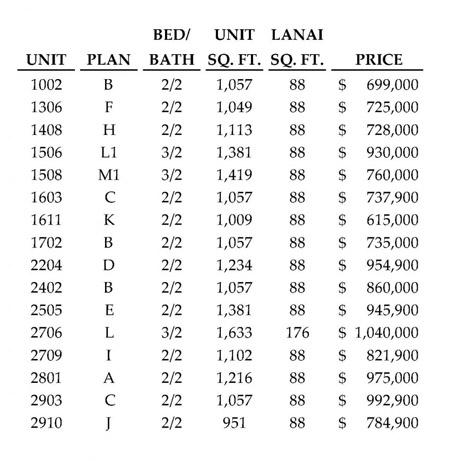 We currently have listied a brand new, never used condo for sale in Allure Waikiki, #2806, that is priced to compete with the prices shown above. Friday, October 28th, 2011 at 10:56am. According to KITV.com News online, "Musician Jake Shimabukuro turned up the heat on an already hot day at the Waikiki Shell." "The ukulele phenom wasn't only performing; he was helping to break the record for the world's largest ukulele ensemble. With a representative from the Guinness Book of World Records watching, Shimabukuro started it off." "Shimabukuro taught the crowd a musical melody; they would need to play in unison for five minutes." "The first world record was set in Helsingborg, Sweden, where more than 1,500 people participated on Aug.20." Thursday, October 27th, 2011 at 11:06am. According to the "Hawaii Reporter", "A soaring residential skyscraper that would tower over Honolulu’s highest buildings has been proposed by the state for development on Pohukaina Street in Kakaako." "The building could be as much as 650 feet high – more than 200 feet above the First Hawaiian Bank Center, which at 440 feet is the tallest structure in the Islands." "Called 690 Pohukaina, the project would also include two smaller residential and commercial towers as well as a parking structure and a civic/community center." "Governor Neil Abercrombie praised the proposed project, which won initial approval today from the Hawaii Community Development Authority." Wednesday, October 26th, 2011 at 5:05am. With Fall comes a chill in the air and dropping temperatures. Buyers and renters alike are moving about looking for great deals. In St. Louis we are seeing a nice uptick in activity as clients are coming to Highrises.com seeking the perfect home for their next move. With a healthy inventory of lofts, condos, luxury homes and developed communities, clients have a wide selection of homes to choose from as they begin their journey. We receive many compliments from our clients on the ease of navigation on Highrises.com and the quick response clients receive from our buyers agents once registered on the site. Tuesday, October 25th, 2011 at 10:44am. According to the "Star Advertiser" online, "Access to the busiest streets in the Ala Moana-Waikiki region will be limited severely during next month's Asia-Pacific Economic Cooperation meeting, under federal restrictions issued this morning." Access to the busiest streets in the Ala Moana-Waikiki region will be limited severely during next month's Asia-Pacific Economic Cooperation meeting, under federal restrictions issued this morning. The U.S. Secret Service released maps detailing the road closures, parking restrictions and other security measures for Waikiki and Ko Olina. The security zones also include airspace and ocean restrictions. Tuesday, October 25th, 2011 at 9:43am. Freddie Mac's latest Primary Mortgage Market Survey showed rates for 30-year fixed-rate mortgage (FRM) averaging 4.11 percent with an average 0.8 point for the week ending Oct. 20. That's virtually unchanged from 4.12 last week, and not far above the all-time low in records dating to 1971 of 3.94 percent set during the week ending Oct. 6. Rates on the popular 30-year fixed-rate mortgage were at 4.21 percent this time a year ago, before climbing to a 2011 high of 5.05 percent in February. Friday, October 21st, 2011 at 11:59am. After a prticularly hectic day of work, I decided to take a nice long walk at my favorite Beach Park, the Ala Moana Beach Park located across the street from the infamous Ala Moana Shopping Center. This is a beautiful 76 acre park located along the south shore just west of the famous Waikiki beach area. This beach is noted for its excellent swimming, surfing, and body boarding. There are also lovely shaded picnic facilities and grassy areas perfect for family outings. Visit the Ala Moana Beach Park website. Thursday, October 20th, 2011 at 2:02pm. If you want to be downtown then look no further!! This one won't last long so schedule a time to view it today! Ely Walker features a rooftop deck with BBQ, community room with kitchen and pool, and one of the best fitness rooms on Washington Avenue. This unit features an updated kitchen, in-unit laundry, secure parking and a private storage locker. Thursday, October 20th, 2011 at 10:59am. Local Market Updates ~ Individual reports for the various neighborhoods which display both single-family and condominium sales activity. Download the September 2011 Local Market Updates HERE. Wednesday, October 19th, 2011 at 1:55pm. Last night I was watching Selling New York on HGTV and gained a great tool we all could benefit from. One of the agents was receiving some hesitation on the neighborhood of where he had a listing. This agent actually lived in the building where his listing was. The neighborhood was being questioned by several potential buyers and he couldn't understand why because he found the neighborhood to be amazing. He decided to incorporate the condo tour with a neighborhood tour to show off all the great stores, shops and restaurants in the area.